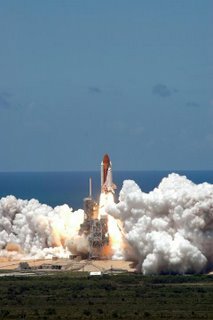 The space shuttle Discovery successfully launched yesterday evening from Cape Canaveral in Florida. Yesterday's Independence Day launch was the third attempt, the first two being 'scrubbed' for poor weather conditions. The crew of 7 is on it's way to the international space station to take supplies and drop of a new ISS crew member. They will also carry out more tests of procedures and equipment to ensure future shuttle operations are safe. 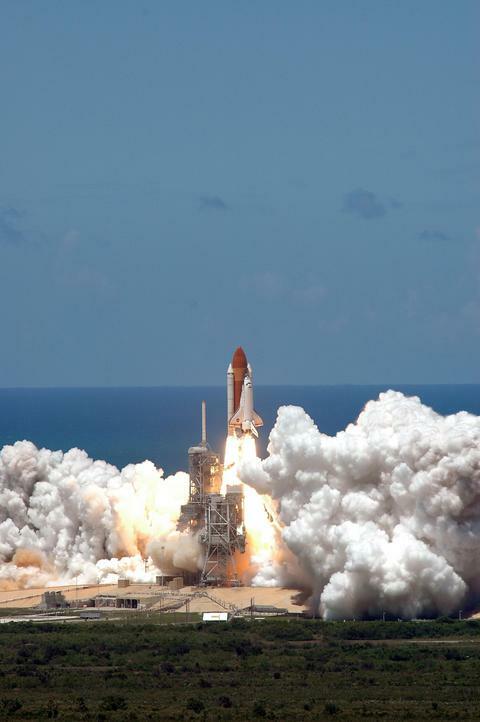 Discovery is due to return to Kennedy Space Centre on 16th July. NASA report that although several small pieces of foam fell of during the launch, these will not pose a threat to crew safety. Perhaps the pre-launch concerns about foam falling of the external fuel tank, as well as the 4th July launch has added to the publicity, giving excellent coverage. The launch was shown live on BBC News 24 channel.